( Please see the number below for our 24 hour answering service line. 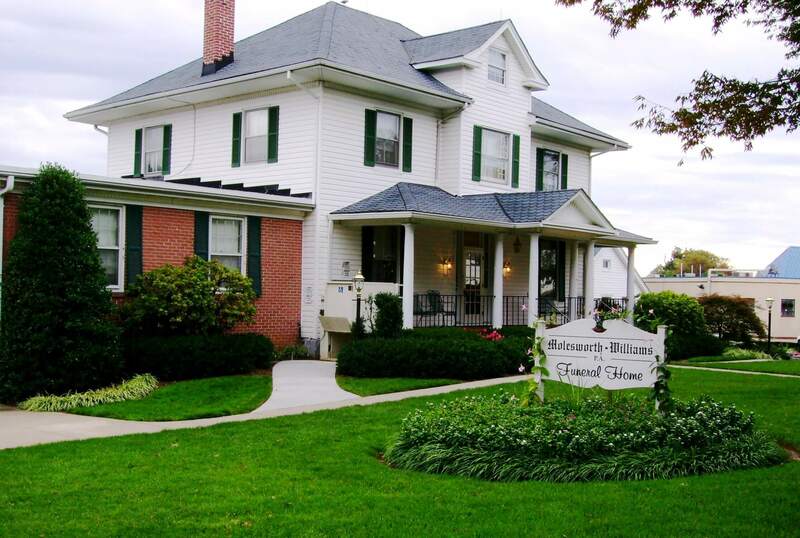 Molesworth-Williams Funeral Home has been serving families of Damascus, Mount Airy, Clarksburg, and Germantown, Maryland and surrounding areas for more than 70 years providing necessary arrangements and services for the passing of loved ones. Our roots date back nearly 200 years to the original owner and founder William T. Lewis, to the small log cabin which stood on Maryland Rt. 80 in Kemptown, Maryland until the winter of 2014 when it was dismantled and moved to a location near the present Funeral Home in Damascus. We take pride in knowing we have served the surrounding communities longer than any other funeral home in our area and we plan to continue our services for many years to come. At Molesworth-Williams, we provide an array of service options to accommodate a variety of needs for celebrating the lives of those lost. We pride ourselves on making the events as comfortable and special as possible. In combination with your ideas, we will guide you every step of the way to make the process easy and straight-forward. We also offer the convenience of those out of town family and friends to view obituaries of those who are deceased and send condolences, when they are unable to be with the family in person. If you have any questions at all, please don't hesitate to contact us at 301-253-2138. We are here to help serve you.